In just under a month we will be performing a Christmas concert with fellow East London community choir Victoria Park Singers! 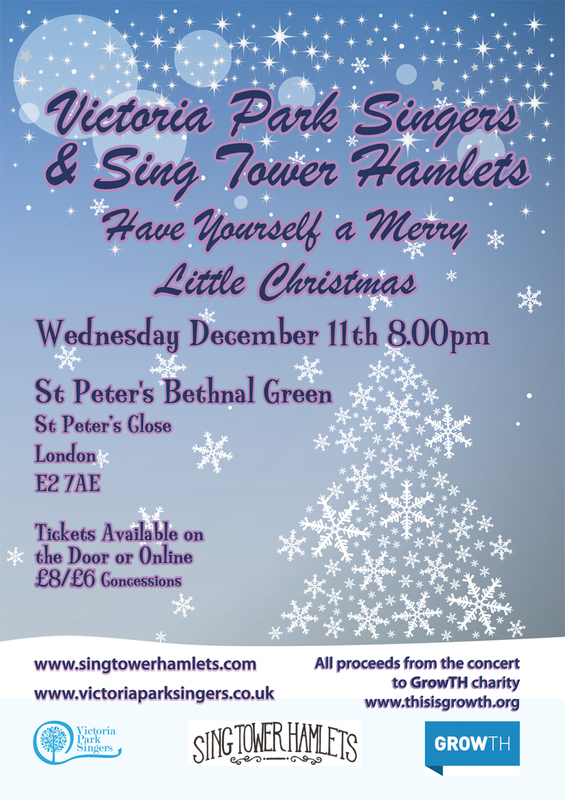 The concert is on Wednesday 11th December, 8pm, at St Peter’s Bethnal Green… and we’ve been getting well into the festive spirit in rehearsals the past few weeks! The concert will feature seasonal music including Baby It’s Cold Outside, Have Yourself a Merry Little Christmas and a selection of carols. Our two choirs will bring together 80 singers to perform several joint pieces, as well as our own repertoire, and we hope also to be joined on the night by some guests from the GrowTH night shelter, for which the concert will be raising money. GrowTH is a great local charity working with Tower Hamlets churches to provide emergency beds and food for homeless people throughout the winter. Last year alone they brought together some 400 local volunteers to provide shelter for 169 people, and helped 54 of those into permanent accommodation. Through this concert we hope to raise as much as possible for this work supporting vulnerable people in our area. Tickets (£8/£6 concessions) are available from singtowerhamlets@gmail.com, or on the door.